It may be that this set was used for some nighttime ops and was painted black in the field. Maybe also "U.S. Sketching Board Model 1913" was taken off using paint remover? The paper goes between the round shiny pin and the bottom of the hold down top. One of the Velcor strips has come unglued from the bottom of the table and can be seen here stuck to the lower right corner of the cover. 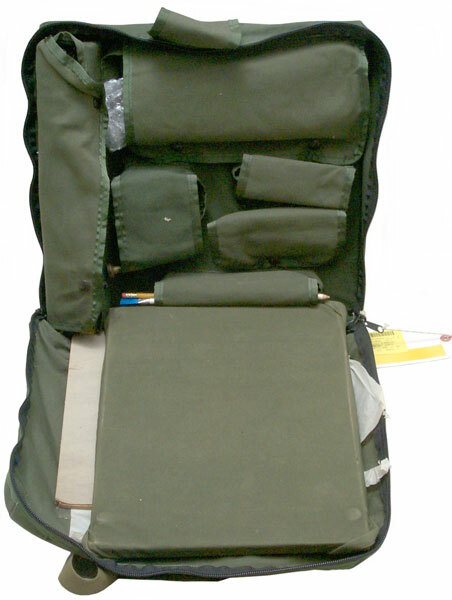 This is a military Sketch Set that's designed to be field portable. 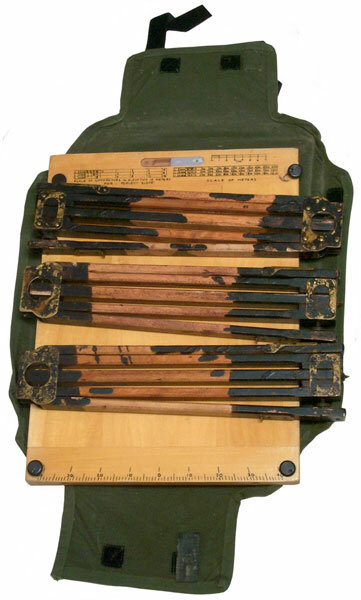 The set is an example of Plane Table Surveying. This method was the official way the U.S.G.S. made maps for many decades and is old enough that there are plenty of free books on line that describe the methods (see Links below). Most any good book on surveying will have a chapter on plane table work. The typical setup is to level the table then orient it so the top is facing North (true is preferred, but magnetic will do if so noted). Any device that allows sighting to a landscape feature (called an alidade) allows drawing a line from a point on the paper that's your current location through the feature. Note that the exact bearing of the board/paper is not too important since the lines to the features are correct in a relative sense. If you have a way to determine the distance to the feature then it can be scaled and marked as a point on the paper. The method of stadia can be used with a telescope that has the required reticule. This may be either a surveying instrument or a rifle scope. A laser or optical range finder would also be a modern way to get the distance to a distant object. If you don't have a way to get the distance then each feature line can be labeled in pencil with the feature name. One of the feature lines is to (or from) the new table location. The distance between the two table locations needs to be established so the new location can be added to the paper as a point. Now sighting the same features as before and drawing a line to them from the new point of table location results in locating each visible feature as a point at which time the construction lines can be erased. "As background, I am a retired Army Corps of Engineers officer and spent most of my time in the Topographic field managing surveying, mapping and terrain analysis (military geography) efforts around the world. 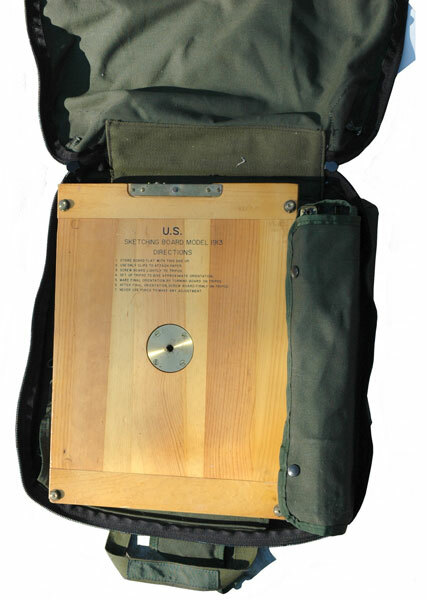 I am very familiar with the M1913 Sketch Set as it remained in our MTOE authorizations into the 1980s. In my assignments as unit commander I've probably inventoried a few dozen of these things as they were part of our equipment authorization. By the time I came on active duty (1979) the process of 'military sketching' was already obsolete, but we seemed to hang onto a lot of old equipment 'just in case'. None of my surveyors could really tell me how we could use this sketch set, and there was no manual (FM or TM) that described it's use. We'd set them up occasionally for equipment displays, but that was about it. I always thought they were a quaint item, something interesting to set up and play with. Well, fast forward to my post-retirement years and my growing interest in Army Topographic history and equipment. I came across a semi-complete Sketch Set on eBay earlier this year and grabbed it. When it was delivered I was surprised to see it was virtually unused. 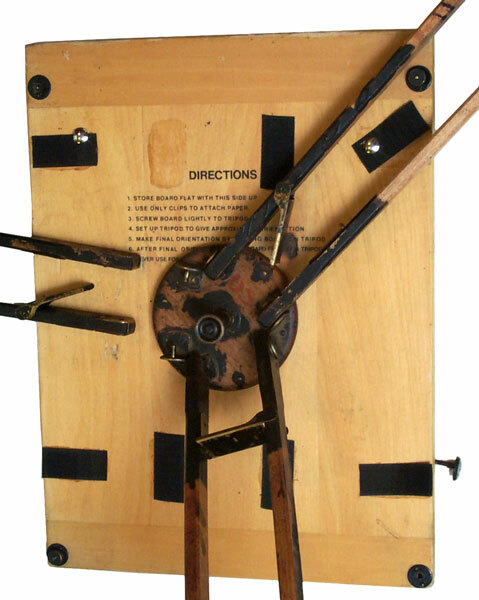 It was lacking a compass, hand level and a few smaller expendable items like pencils and erasers, but the plane table, tripod and case were in almost new condition. This acquisition sparked my interest - just how was this Sketch Set supposed to be used? Why did the Army adopt it, and what was it used for? Surprisingly, I already had the answer but didn't realize it. Part of my collection is a library of old Army map reading and land navigation manuals that go back as far as 1917. Prior to 1938, before the Army had established standardized topographic map production and distribution (through the Army Map Service), it was the individual unit's responsibility to acquire or create local maps for internal use. Army doctrine, as outlined in these pre-1938 manuals, heavily emphasized military sketching. If you were a battalion or regimental commander and you were going to the field you would ring up your engineers or S2 section and have them prepare a route sketch and a field sketch of the area you were going to be operating in. What did the Engineers or Intel Section use to prepare these sketches? 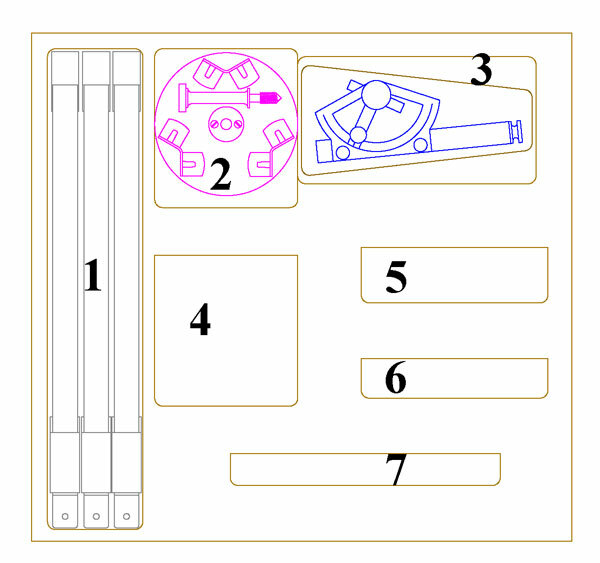 Yup, the M1913 Sketch Set. In 1938 it appears that the Army realized it needed to separate the practice of field sketching from map reading and land navigation. Military field sketching was a specialized skill that required a lot of training and practice, but map reading and land navigation was something EVERY soldier would need to learn. 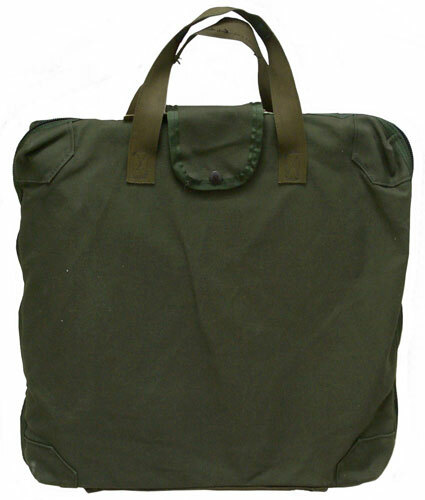 This is when the the famous FM 21-26 (Map Reading and Land Navigation) series of manuals got its start. In 1938 the Army published FM 21-35, Sketching, This FM was already in my collection, but I never paid much attention to it (I think I picked it up as part of a package purchase along with several other manuals). A few months ago I was flipping through the FM and was surprised to see that a lot of the illustrations were of the M1913 Sketch Set! I sat down and read the manual cover to cover and realized that it's this FM that specifically describes the use of the M1913 sketch set. In fact, the manual is built around the sketch set and its use. As far as I cant tell, FM 21-35 is the only manual the Army ever produced that is focused on military sketching, and as far as I can tell, the Army never updated this FM - the 1938 publication is the first and only dedicated Army treatise on the subject. Sketching continued to be lightly discussed in future editions of FM 21-26, but never to the detail covered in FM 21-35. Copies of FM 21-35 come up occasionally on eBay, if you'd like to get a copy. So, what looks like happened is that the Army kept the M1913 sketch set in the inventory (and continued to manufacture them up through at least the mid-1900s), but never updated the basic manual. Without the manual the practice of military sketching became a lost art." "A collection of surveying equipment such as sketching board, clinometer, boxwood alidade and the like. Permits sketching approximate contours but is not intended for accurate surveys as no precise surveying equipment is included." FM 21-35 Sketching 1938. Only published one time and not updated or republished although the M1913 sketch set was made up into the 1980s. But without the manual to go with them, not much practical use. This is a hand held Veeder Root type counter. Felsenthal Instrument Co. Part No. 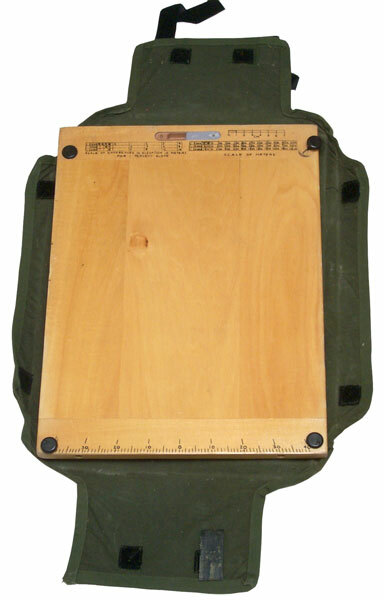 FAE-9A - combined 6 inch ruler and protractor. By removing the plastic cover on the broad's built-in compass and cleaning it with Optic Guard Anti-Fog Optical Cleaner the electrostatic charge seems to have been removed. Prior to applying the cleaner the compass needle was attracted to the plastic and was stuck. page created 21 Jan 2010.